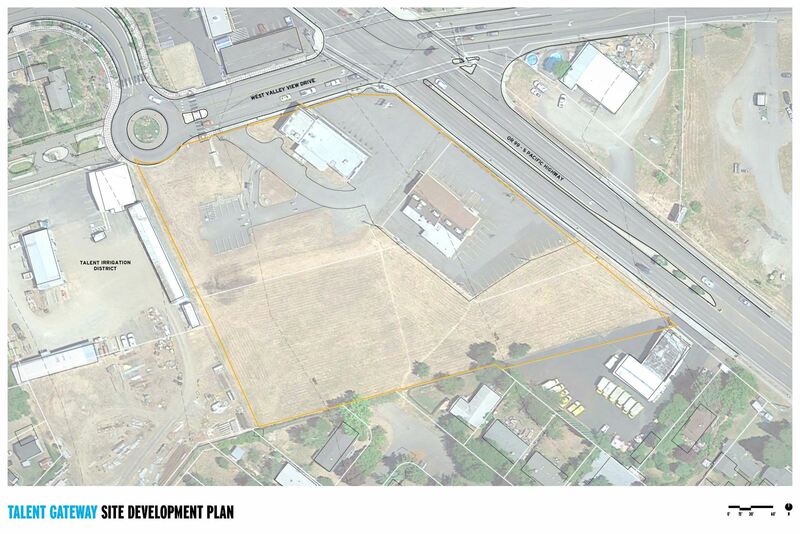 The Talent (Oregon) Urban Renewal Agency (Agency) is seeking proposals from well-qualified developers to implement its vision for the Gateway Redevelopment Project on a 4+-acre mixed-use property adjacent to its historic downtown. 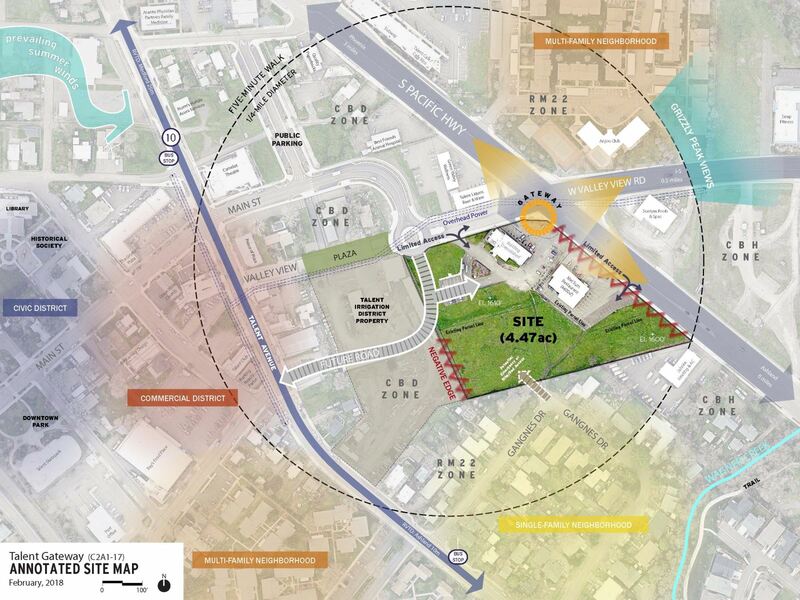 The project is envisioned as a catalytic development that will combine cutting-edge design with environmental sustainability in an up-and-coming, forward-thinking community in the highly desirable Rogue Valley of southern Oregon. development projects and any related experience with redevelopment, public private partnerships, and/or mixed use projects that further implement the economic and housing goals adopted in the City’s Comprehensive Plan.Under current market conditions, the Agency understands that a public/private partnership may be necessary to refine and implement the vision of the pioneering Gateway Redevelopment Project. The Agency prefers to work with a single developer that is able to develop the entire site, but will accept proposals from those that are interested in developing only a portion of the site as well. The Preferred Developer will demonstrate that its proposal and redevelopment of the property will become a focal point of the downtown and a catalyst for continued development in the City. The RFP document is available at the City of Talent website at www.cityoftalent.org/RFP.asp. The Transportation and Growth Management (“TGM”) Program is a joint effort of the Oregon Department of Transportation (“ODOT”) and the Oregon Department of Land Conservation and Development (“DLCD”). The purposes of the TGM program are to strengthen the capability of local governments to effectively manage growth and comply with the Transportation Planning Rule, to integrate transportation and land use planning, and to encourage transportation-efficient land uses that support modal choice and efficient performance of transportation facilities and services. Talent Gateway Site Development Plan offers an opportunity for City of Talent and Talent Urban Renewal Agency (“TURA”) to plan for future development in a way that reduces transportation system demand. The concepts and plans for project area will be consistent with compact, mixed use, pedestrian-friendly, low-impact, and sustainable development. Develop a phased program for future mixed-use development that includes illustrative conceptual architectural and site plans consistent with TGM objectives and TURA’s development goals. Determine market feasibility of various types of community identified mixed-use development products in Project Area. Determine economic feasibility of illustrative conceptual architectural and site plans consistent with City, TURA, and TGM objectives. Identify barriers to and potential incentives for development based on illustrative conceptual architectural and site plans. Determine what off-site transportation improvements may be needed to accommodate and support mixed use development.